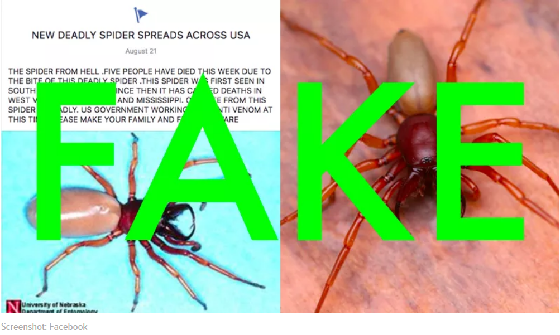 If you’ve seen a viral Facebook post about a spider “from Hell” killing people in West Virginia, Tennessee, and Mississippi, I have some good news: It’s completely false. Since it was first posted on Tuesday, “NEW DEADLY SPIDER SPREADS ACROSS USA” has been shared on the social network over a million times, but the spider shown in the post isn’t a killer. It’s not even new in the U.S. The photos included in the Facebook post show the woodlouse spider, scientifically known as Dysdera crocata, according to Rick Vetter, who co-authored a journal article about the species’ bite. “There’s no proof whatsoever these things are dangerous,” Vetter, a retired research associate from the Entomology Department at University California, Riverside, told Gizmodo. While originally from the Mediterranean, these spiders have been found throughout the world for years, and Vetter said there are no known deaths associated with the woodlouse spider. “If it was dangerous, we would know about it already,” he said. Woodlouse spider bites are characterized as “virtually innocuous” in Vetter’s article, which notes that the primary symptom of the spider’s bite is “minor pain” which usually lasts less than an hour. Because this spider has large fangs it bares as a defense mechanism, it is commonly mistaken for the brown recluse spider in the U.S., the article states. The woodlouse spider is often found in homes and gardens, according to the article, which means there’s a high likelihood human will come across it, and because it shows its fangs when it feels threatened, people misinterpret the behavior “as evidence that this is an arachnid of dangerous potential.” It’s not. Because the Facebook post doesn’t indicate what species of spider is featured in the photos, it’s difficult for the average person to do a cursory search and determine whether or not the claim is rooted in fact. And aside from stoking fear where it’s not merited (and in turn increasing general arachnophobia), Vetter said spreading this type of misinformation also causes people to misidentify spiders as dangerous. “Anyone can post anything they want and there’s no basis for truth in anything that’s listed in that post,” he said. As Snopes pointed out, a Facebook user named Gary Neaderhiser is the author of the now-viral Facebook post, and his page has a history of sharing wildly (often humorously) inaccurate stories. For instance, his most recent post states that =68.ARDwdSCY1v0nvM6F46VpBSH2CLAfKRmZ1bikv6yCZvVAUl8ESAgv3_7ljvHQKKFAB9mgXqr_LBnS77fL8JAXVy5z4A3tEsGlLGFlCyjtlWL2wzBbIt0JjJ17v6kbE5uYRFvt3_I&__tn__=-R]a headless mannequin stabbed a man in a mall. This is hardly the first time the woodlouse spider has been misidentified. Vetter pointed to a recent article about The Voice’s Meghan Linsey getting bitten by a brown recluse spider. In the print version of the story, the publication included a photo of a woodlouse spider.